This card's Japanese artwork shows that it may be based on the Baphomet. This card's name could imply that it's a weaker version of another monster with the same effect. 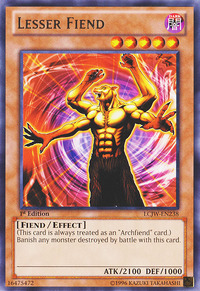 Anything with "Archfiend" in the name. Monsters destroyed by this card as a result of battle are not sent to the Graveyard, so "Sangan" or "Mystic Tomato" would not have their effects activated, and the effect of "Kycoo the Ghost Destroyer" will not prevent them from being removed from play. This card does not negate the effects of monsters it destroys as a result of battle, so a Flip Effect like "Cyber Jar" or Trigger Effect like "D.D. Warrior Lady" will still be activated. "Cyber Jar" would still be removed from play in this example, since damage calculation occurs normally. If "Lesser Fiend" battles with "Relinquished" equipped with a Monster Card, and that equipped card is destroyed instead of "Relinquished", it is not removed from play since it is the effect of "Relinquished" that destroyed it and not as a result of battle with "Lesser Fiend". D.D. Scout Plane: If "D.D. Scout Plane" is destroyed by "Lesser Fiend", "D.D. Scout Plane's" effect activates and it is Special Summoned even if "Dark Ruler Ha Des" was also in play when it was destroyed. Grave Protector: A monster destroyed by "Dark Magician of Chaos" or "Lesser Fiend" is returned to the Deck instead of being removed from play.